Rep. Barney Frank and some colleagues took a military jet to Europe at a cost of $160,000. Earlier this week, we ran a report on members of Congress using expensive military chartered jets for their trips abroad. The report pointed out that members of Congress could fly business class on commercial planes for a lot less money than the estimated $10,000 an hour spent on military charters. One of the trips we reported on was Massachusetts Rep. Barney Frank's trip to London and Brussels. We estimated his flight cost $160,000. He and his group of 10 could have flown commercial business class for about for $80,000. Why did he take the charter? His press officer told us on May 1st the congressman was too busy with Iraq war funding issues to talk to us, but said that the charter "made it a lot easier in terms of transportation." We also pointed out Rep. Frank's trip apparently violated two U.S. House of Representatives rules for using a military charter: he did not include five members of Congress on his trip (required minimum is five) and he did not include any Republicans (trips must be bipartisan). "CNN recently ran a report on Congressional travel which distorts the reasons and the justifications for the use of military aircraft for a recent Congressional delegation trip I led to London and Brussels. We fully complied with verbal guidance from the military and with the Speaker's January 23, 2007, memo on travel, which states that trips must be bipartisan. CNN expressly criticized me for not including Republicans on our trip. I made several efforts to ask Republican members, some personally, but no one could attend due to scheduling conflicts. In fact, invitations were extended to all Republican members of the Financial Services Committee, and the Republican leadership of the Committee designated two high level staff members to attend the trip, something CNN failed to report. The Office of Interparliamentary Affairs (OIA) advised my staff that as long as a "good faith effort" was made in asking Republicans to travel with us, the delegation could proceed. There was no attempt by me or my staff to exclude Republican members of our committee on this trip. "Going into the last two weeks before the trip we had five Members scheduled and interest by more members, but two members dropped off for professional and personal reasons -- with one member dropping off just days before we departed. CNN never sought to talk to me about this, nor did they give me a chance to respond to people who were reportedly critical of our efforts before the report aired. "Use of military aircraft, while limited, does give us the ability to maximize our schedule and get more done in a shorter amount of time. We flew mostly at night in order to have more meetings during the day. It also allows us to work on the aircraft to further manage the time we are spending away from home. "I noted with interest that CNN did not report on the details of our schedule. The delegation met with government officials, legislators, trade unionists and financial firms and private firms to better understand issues related to the financial services regulatory structures of the US, the UK and the EU. The delegation focused on issues surrounding the increasing global reach of financial services on markets and what it means for the future of financial regulation. In London, the delegation held meetings with financial regulators, investors, EU Commissioner Charles McCreevey and visited with the leaderships of the London International Financial Futures Exchange and the London Stock Exchange. The delegation then continued to Brussels, Belgium, on a one day visit where they met with members of the European Parliament, the European Banking Federation, and with representatives of the international trade union community who have raised concerns about the growing role of hedge funds and private equity pools of capital. The House Financial Services Committee has jurisdiction over US securities regulation and the banking industry." So what's next? Congress is about to begin its next rite of spring, the Memorial Day break. I'm sure the engines on those Boeing jets at Andrews Air Force Base are already warming up. We'll let you know where your tax dollars are flying this time around. My wife Robin first mentioned this story to me. She had heard about a Web site called "Ivescrewedup.com" while listening to a morning radio program. My immediate reaction was, "This is a great story, but I've got to see it to believe it." I went online and typed in the address: Ivescrewedup.com. Sure enough, there it was -- a place you and I can go to confess our sins anonymously; a place we can be absolved of our sins if our written words are truly repentant and from the heart. The Web site was set up by the nondenominational Flamingo Road Church in Cooper City, Florida. The church's lead pastor, Troy Gramling, and some church leaders came up with the idea as a way to reach people outside the church. Why couldn't the Internet highway be a road to salvation? With so many people living a large part of their lives on the Internet, Gramling says the site is a way to bring people back to religion, in particular, the kind of people who don't feel comfortable with face-to-face confessions. But he said he had no idea how huge a hit the site would become. About 1,100 confessions have been posted since the site went up on Easter Sunday. Most of them deal with sins of the flesh and drug addiction. Gramling admits there's no way to know for sure which are legit, but he is confident that the ones they post after a screening process are in fact the real deal. I'm not going to quote any of the confessions here. You can read them for yourself. Gramling, a young guy who dresses like he just stepped off a Texas cattle drive, isn't sure how long he will keep the site up. Because of its success, he says, perhaps indefinitely. "It's cool" that so many people are coming to the site, Gramling says. But he is disturbed that so many people are carrying burdens in their heart and seemingly have no one with whom they can share them. As I scrolled through the confessions, one thing became clear very quickly: the site is a place people are visiting -- at the very least -- to get things off their chest. Whether they are all true confessions is something between the authors and God. The Shot: Catch that ape! Despite outrage from a lot of you about members of Congress using military planes for their overseas spring breaks, there seems to be precious little reaction from the people who can actually stop it: Congress. The morning after our report aired I flew to Washington to turn a follow-up story, expecting the usual outrage from members of Congress who thought we treated them unfairly. Instead I got silence. Congressman Bennie Thompson's office didn't complain about our report on his trip to Mexico and the Virgin Islands. Congressman Eliot Engel's office didn't call about his trip to Trinidad and Tobago. All done, mind you, on expensive and luxurious military charter planes. Then, as I was chewing down my salad in the basement of the Cannon House Office Building, just about 11 a.m., came the call from Barney Frank's office. Congressman Frank had the most expensive flight as far as I can tell. And judging by House rules about using military planes, he violated both of them. He flew to London and Brussels with just two other members of Congress (you are supposed to have five) and he took no Republicans (the trips are supposed to be bi-partisan). Estimated cost of just the flight: $160,000. He and the whole group could have flown commercial business class for about half the cost. His press secretary was really mad, but I couldn't really tell why. Basically, it seems, the anger was because I actually told you about that trip. In any event, I was there to do the follow-up and I asked again if the press secretary or perhaps the congressman himself would like to go on camera. My crew and I were ready. I was told we'll get right back to you. Then I was told could you do it later today. Then I was told how about tomorrow morning. Last night I was told there would be no interview. There was no explanation. I asked for a statement. I'm still waiting for a statement. In the meantime, I plan to keep pressing on why so many trips are being taken on military charters. IAEA: Iran atomic work defies U.N. I'll admit I've been on nicer planes, but the Boeing 737 Executive Jet operated by the 201st Airlift Squadron of the D.C. Air Reserve Guard is pretty nice. Plush first-class seats, just 34 on the entire plane. There's a conference area with a table, a full length couch. Retractable movie screens pop out of the ceiling to view the latest films. And in the back, the galley is equipped to deliver snacks, appetizers and full meals. In fact, Master Sergeant Don Humphries, who acts as the first flight attendant, says that when a trip gets planned, he starts planning the menu. The sergeant gets a budget and special requests, and then he goes shopping. Once all the groceries are bought, he and his staff hand carry and load them on-board, so these Air Force reservists can be prepared to cater to their passengers' every need. It all sounds great, doesn't it? Sounded great to me too until I realized the mission of this plane is to fly around members of Congress on some questionable trips. Officially, they are called CODELS: Congressional delegations. Members of Congress use these military jets to fly all over the world on fact-finding missions. Flying in military jets is especially important when our leaders need to go to Iraq, or remote parts of Africa, Afghanistan -- places that are hard to get to or dangerous to visit. But the Virgin Islands, Trinidad, London? At $10,000 a flight hour, those places are where some of your representatives took these military planes over spring break. 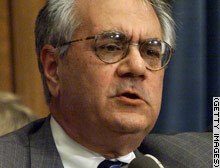 The bill for Rep. Barney Frank's flight to London and Brussels was $160,000.00. He could have flown his entire group business class for about half the cost. But his spokesman said flying the military charter made the transportation a lot easier. Let me know if you think you got your money's worth. Editor's note: When leaving a comment, please don't forget to add your name, city/town and state. • Did you order the pork? • The Shot: Watch your step! • The Shot: Catch that ape!